Think life ends when turning fifty? Writers Lynn Hull and Julie Molner believe it’s only the beginning when dreams become reality. 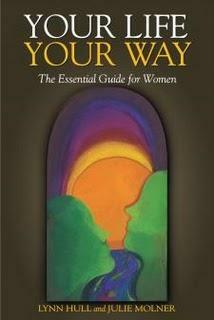 In Your Life Your Way: The Essential Guide for Women, these professional co-active coaches want every woman to push aside their insecurities and stand up for a more satisfying life. Unlike most self-help books where authors merely give advice, Hull and Molner create exercises that not only evaluate the living situations of females, but also provide a hands-on approach in completing any goal, no matter how big. Through revealing personal experiences, such as Hull’s determination to get a Masters at forty-eight and the death of Molner’s grandson, they encourage readers to peak into their many joys and struggles, while discovering practical tips in tackling anything from breast cancer to becoming a shaman. Can your shrink do that for less than $20? The heart of Your Life Your Way is in the well-organized exercises that don’t just list easy answers to life’s unpredictable scenarios, but demand you take action for happiness. The book starts from the simple “List ten or more things you’ve wanted to do,” to the thought-triggering “In what ways am I honoring my values on a daily basis?” However, don’t expect to expose your emotions in journal entries alone. The authors want women to say out loud what disappoints them, plan out ways to celebrate their current successes, and meditate, no fancy yoga class required. Some exercises may be uncomfortable to face, such as “What’s your reason for buying cosmetics?” as well as the realities of friendships. “These perspectives on friendship certainly help us see that not all people are sent our way for life…and that makes it OK to let go when the time is right,” they explain. Forget being “the new thirty,” and do exactly what Eleanor Roosevelt, Dame Judi Dench, and helicopter flying grandma Jennifer Murray have done: Be fifty and damn proud of it. With Hull and Molner’s no-nonsense, but highly encouraging guidance, along with a collective of real-life anecdotes and inspirational, stimulating exercises, you’ll be ready to tackle life at any stage. Trips to the self-help aisle in your local bookstore don’t have to be embarrassing, and with Your Life Your Way, getting older means getting ready to live.